Tube feeding requires a number of medical supplies. 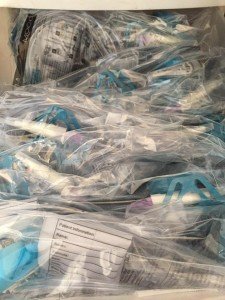 These include button-style feeding tubes, standard G-tubes, NG-tubes, extension sets, adapters, syringes, tape, gauze, feeding pumps, feeding pump delivery sets, Farrell valve bags, gravity bags and formula. While some tubes must be placed and provided by the hospital (typically J-tubes and GJ-tubes), most everything else can be supplied by your home care provider. 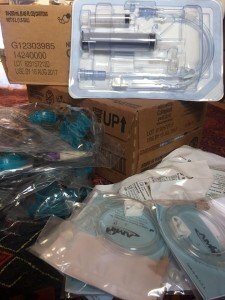 When beginning or restarting service with a home tube feeding company upon discharge from the hospital, a small shipment of supplies may be delivered to the hospital or the home to get you started. Once discharge is confirmed, the remaining first month’s shipment will be delivered to your home. Sometimes, hospitals provide a few days of supplies for you to take home. Some supply companies offer in-person training on tube feeding pumps and other equipment. This may occur while you are still in the hospital with your child. Others may coordinate or offer a visiting nurse to help train you on tube feeding once you get home, or they may have a nurse or dietitian phone line for questions. However, some will send your supplies through a delivery service or person who is not trained on the equipment or supplies. Make sure you ask about your supplies before leaving the hospital so you understand what you will need to use at home, particularly if your child is going to be fed by feeding pump. The pump in the hospital may not be the same as the one you will use at home. If you do not already have a company to provide tube feeding supplies and you or your child are preparing to go home with a new feeding tube, your hospital discharge planner or case manager will assist you. They may supply you with a list of companies to select from or recommend a preferred home tube feeding company based on their experience or directions from your insurance provider. 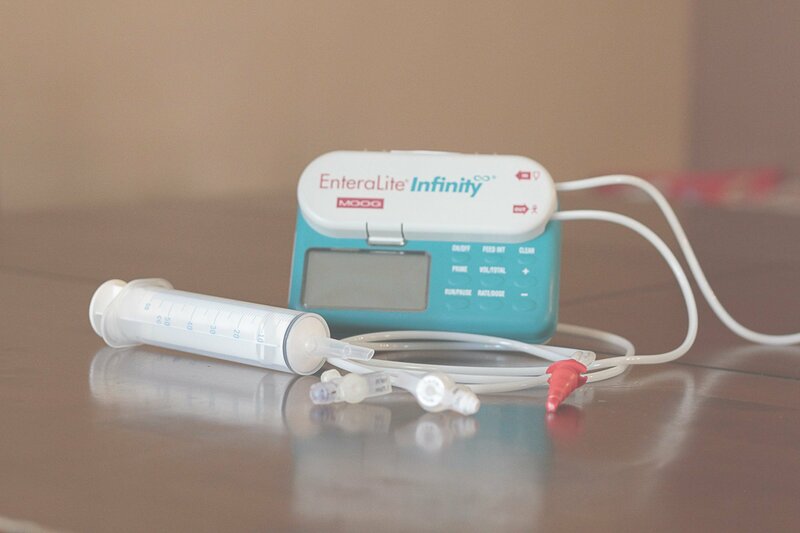 Tube feeding supply companies vary in their offerings as far as pump selection, clinical monitoring and screening, dietitian support, insurance contracts, and after-hours support. Note that it is ultimately your choice when deciding what company you want to use, and you should make sure your choice offers all the services you need. When you choose your supplier, you have a choice between pharmacies/home infusion companies or Durable Medical Equipment Suppliers (DME). Either a DME or pharmacy can provide formula and the tube feeding supplies, but your options may be dependent on insurance contracts. Pharmacies/home infusion companies are big players in the distribution of medical supplies for tube feeding because of the medical nature of the diet being prescribed. We aren’t talking about your neighborhood pharmacy. These home infusion pharmacies have divisions dedicated to tube feeding as well as IV nutrition and tend to be larger, more national companies. Examples of pharmacy/home infusion companies include Coram CVS Specialty Infusion Services, OptionCare, and Bioscrip Home Infusion. In many areas, they have subsidiaries that act locally under different names. DMEs, in contrast, focus on the delivery of a broad range of medical supplies from feeding pumps to incontinence supplies and wheelchairs. Some examples are Medline, Edgepark, and Landauer Medstar. You can change supply companies or use more than one company at any time, if your insurance allows you to do so. Service from a new company usually requires verification that they are contracted with your specific insurance plan and may require insurance authorizations be resubmitted. This can take some time, so keep that in mind before cancelling your old company. Educate yourself about your options and inquire with your insurance company or Medicaid plan, who should be able to provide a list of home tube feeding supply companies that are contracted with your child’s insurance. Your doctor will send a prescription to the home care company ordering the supplies that they think you will need at home. These supplies are typically delivered once a month. However, once you are home, you may find that you need additional supplies or different supplies. Call your company to see if the changes you would like to make require your doctor to send a new prescription. In many cases, you will need a prescription for a specific product. Your home care company may work with you to identify versions of any specialty supplies such as securement devices, dressing, and adapters, because the specific item your hospital used may not be available from your home supply company, but an alternate option is likely available. Many supply companies will contact you about a week in advance of your delivery date to confirm your order. Some companies are moving to systems to make this process easier by emailing reminders, making automated calls, and allowing orders to be placed online. Sometimes the automated calls may appear as a toll free number and can be confused as a telemarketing/solicitation call. Confirm that your supply company has the best number to reach you on file. Many insurers, including Medicaid, need a prior authorization in order for insurance to be billed, and in many cases they must speak to you personally before sending our your shipment. This process can take days or weeks depending on the payer. Some Medicaid and private insurance plans follow strict date spans that prevent early shipments. Anytime your child’s prescription for formula increases, it is important to have that prescription sent in to your supply company as soon as possible, so they can request authorization for the volume increase. Finally, keep in mind that the customer service representative at your home care company may have limited knowledge about some of the different types of extension sets, adapters or dressing. If you are looking for a specific product, note the product number from the manufacturer website or package labeling to help identify the specific item and its availability. Tube feeding supply companies are paid a daily rate from most insurance companies and state Medicaid plans based on what tube feeding supply “bundle” your child receives. 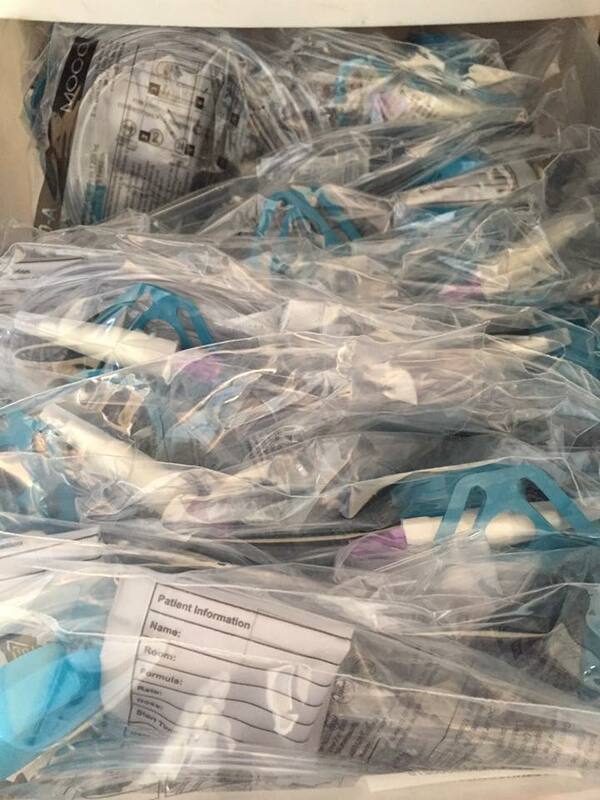 Regardless of the billing method, items like tape and gauze are not reimbursed individually, as they are non-billable items and are generally included as part of the feeding kit. Bundled rates are based on the feeding method. For example, the daily rate would be higher for children who have feeding pumps as compared to a child who bolus feeds because more expensive supplies are needed. Tricare, Medicare, and some state Medicaid plans bill for the supplies separately and not in a bundled rate. The supply company determines what is included in the supply bundle based on usual and customary practices and standard reimbursement rates. Because reimbursement rates are the same no matter how much they send you, some companies may not provide “extras” like tape, gauze, or additional syringes unless you specifically ask for them. The typical items each company sends varies considerably based on the company and your child’s needs. The larger, national companies tend to include items such as tape and gauze more freely, and may supply you with some extras as needed. Please keep in mind that in some cases the supply company does lose money if the cost of the supplies you request exceeds what they are paid by insurance, or if you request items unrelated to your child’s feeding tube. Your doctor can write a letter of medical necessity to help you get the extra supplies, and your home care company may be able to bill for certain extra supplies separately. Everything is within reason. You can’t expect to receive items that aren’t being used for enteral feeding, daily syringes for pump feeding, or more than one feeding set per day, for example. 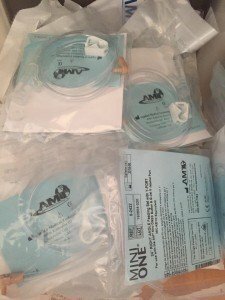 Medical supply companies may only offer one type of feeding pump, but that doesn’t mean you do not have a choice. You can have your doctor write a prescription for the specific feeding pump your child needs with no substitutions allowed. The pump would need to be provided as written. If the supply company doesn’t carry the needed pump, you may need to switch to another company that does provide it. In nearly all cases, feeding pumps are considered a rental item and insurance or Medicaid pays a monthly rental fee. It is very rare that insurance will buy a pump outright when a child first starts to tube feed, because feeding methods change, and some kids may wean or move to bolus feeds via syringe. After a period of time of using the same pump – typically within 2 years – you have rented up to the cost of the pump. At this time, you will own the pump and insurance will stop paying the rental fee. Many companies offer a pump maintenance option when the pump becomes patient-owned that allows the pump to be switched out or repaired if needed. In addition, some Medicaid waivers and insurance plans will pay for equipment maintenance and repair. After a certain period of time, typically ranging from 2-7 years, you may be able to get a new pump covered through insurance or Medicaid. FTAF does not recommend that parents go out and buy a pump. If you buy the pump outright, you may be responsible if the pump malfunctions and needs to be serviced. It is in your child’s best interest to have a company that will supply a replacement pump if there is a pump malfunction. Make sure you have 1 – 2 weeks of supplies, including formula, on hand. Some home care companies will provide backup and emergency supplies, but oftentimes you need to make sure to save extra supplies or use supply exchanges to get what you need. There will be times that the insurance pre-approval may take longer than expected, or there may be shipping delays due to weather or other unforeseeable circumstances. Things can happen to prevent supplies from getting to you on the day you expect them. There are a number of medical supply and formula exchanges where you can find supplies you need for backups or in an emergency. If you run out of supplies, you can often purchase some supplies, such as tape, gauze, or syringes, at a local pharmacy. If you run out of something more specialized, such as NG-tubes or extension sets, you should first contact your supplier to see if they can get you some emergency supplies. In some cases, you may need to contact your hospital or visit the ER for replacement. Note that you may be charged a hefty copay if you go to the ER, so it is best to plan in advance and have extra supplies on hand.